Swedes and their alcohol – a Swedish odyssey? When visiting Sweden, people are often struck by the system for purchasing alcohol. In bars and restaurants everything goes as expected but if you want to buy a bottle of, for example, wine or whisky then this is done in the state-owned alcohol shops known as Systembolaget. These shops have restricted opening hours closing at 6 or 7pm on weekdays and 2 or 3pm on Saturdays. On Sundays and Public Holidays they are closed. Sweden’s alcohol monopoly started in the 1800’s and the national company Systembolaget was formed in 1955. 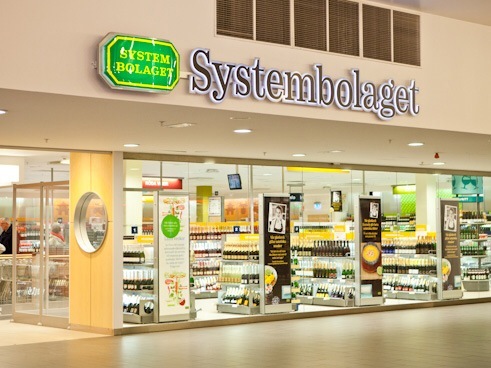 Systembolaget has a retail network of circa 426 stores, around 25 in Stockholm. The company has an interesting mandate from the Swedish state – to help limit the medical and social harm caused by alcohol and thereby improve public health. This explains why access to alcohol is restricted through the number of stores, opening hours and retail rules, and why the corporation is aims not to maximise its profit. In other words, the alcohol monopoly is highly socio-political -its foremost aim is to stop people consuming alcohol, or at least to consume it responsibly. Although strange for many visitors, it’s a concept that seems to work – Swedes consume on average 9.1 litres of pure alcohol per person annually, less than many other countries. However, it is at times like Christmas that the restricted opening times become more obvious. This year, the shops are closed for 4 days from yesterday at 3pm. Up and down the country, long queues were reported. I saw this with my own eyes, and had a weird recollection of old pictures from the Second World War or Soviet Russia. People seemed to be in a good mood while they waited, though it meant waiting for almost an hour outside some branches. I guess it’s the price you pay for lack of forward planning. Anyway, I hope everybody got what they wanted and that they have a boozy, woozy, snoozy Christmas worth queuing for. Today, Friday Dec 21st is the longest night for people in Sweden and the rest of the northern hemisphere. At this time of year, it doesn’t get much darker than this. In Swedish, there’s an expression – now we’re moving towards brighter times – and it’s really relevant today, as from tomorrow the amount of daylight will gradually extend until June. The winter solstice is the official start of astronomical winter, and this year it will be extra special. The winter solstice marks the exact moment each year when the Northern Hemisphere reaches its greatest possible tilt away from the sun, according to National Oceanic and Atmospheric Administration. It signals the beginning of winter in the Northern Hemisphere and the summer season in the Southern Hemisphere. But this year, the solstice isn’t the only celestial show in the coming days. A full moon known as the Cold Moon will take place on Saturday. The moon will appear full for a few days. However, it is the first time it coincides with the winter solstice since 2010. It won’t occur again until 2094, by which time most of us will be dead. In addition to the full moon, a meteor shower will take place on Friday and Saturday nights, according to NASA. So it might be dark and dreary outside, but look up to the sky. You might just witness something spectacular – and I don’t mean Santa and his sleigh. With gay men being hunted down and ‘punished’ in Uganda, Tanzania, Russia and many other countries around the world, it is easy to blame religion for the persecution. And the evidence to back this up is fairly compelling. Countries that have a strong foot in religion are often countries that have strong anti-LGBT policies and attitudes. Not always, but often. Fanatical interpretation of the scripture can be one explanation, as can the crushing concept of sin, and the devouring need to uphold traditional ‘family structures and values’. For example, in a recent comment, the Pope said a lot can be done for LGBT people through psychiatry. Sweden is a country that separates the church from politics. It is a country where almost 90% of the population identify as atheist or agnostic. It is a place where religious morality does not usually dictate the behaviours and choices of individual citizens. Of course there is organized religion in Sweden, there are churches and there are priests. Of course there are minority religions in Sweden such as Islam, Hinduism and Judaism. Of course there are casual believers, devout followers and extremists. But compared to many other organized religions in the world, the Swedish Church is very liberal. This was manifested in the recent service at a church in Stockholm, a service called Gay Jul (Gay Christmas). The slogan for the event was ‘come in as you are, come out as you want to be’. As I sat in attendance at this service, I witnessed a welcoming space, filled with members of the LGBT community, the church decorated in rainbow flags, and the words ‘Gay Jul’ emblazoned on the pulpit. I was moved by the openness of the church to welcome the minority group that is so often demonized and persecuted by the Faithful. It was an escape, and embrace, a sanctuary. However, I was also struck by a sadness as I sat there in that echoing church. I realized the experience was a uniquely Swedish one, occurring in a small city in a small outpost of Europe and an unlikely sight in other churches, mosques, temples and tabernacles around the world. In that church, amongst the rainbow flags, we were far far away from Uganda, and Tanzania, and Russia. So it’s the first of Advent this weekend and this year it comes as a major relief for those of us in Stockholm. You see at Advent, Swedes decorate their houses, apartments and windows with lights. From ceilings, illuminated stars are hung. On window ledges, electric advent candles are placed. On tables, four candles are positioned and one is lit every Sunday up until Christmas. Small candles, often red, are dotted about the home. Some years, there is already deepish snow at the first of Advent, but this year in Stockholm, there isn’t. So it is very, very, very dark. The collective advent decoration is a definite reprieve from this darkness as light is spread into these murky places. The word ‘advent’ comes from the Latin ‘adventus’ which means ‘arrival’ and is traditionally the start of the period where we wait for the arrival of nativity, or Christmas. Some religions also see it as waiting for the second coming of Christ. But in this secular society that is Sweden, the waiting is probably for the snow to come, the cold to hit, the water to freeze to ice and for winter to clasp its fingers firmly around us. In Sweden, since 1960, something has happened every day in the run up to Christmas. A tv series called ‘Julkalendern’ – Christmas calendar- is broadcast early in the mornings from Dec 1 to Dec 24. Sent in 15 minute episodes, it is a different story each year and often stars some of Sweden’s leading actors and comedians. It is very popular amongst children, and is a cozy seasonal tradition. After each episode, viewers can open the relevant door in their advent calendar, which accompanies the program. The stories can vary widely, but most usually there is a Christmas / winter theme and a moral message suited to the time of year. ‘Julkalendern’ sits deep in the souls and psyche of many Swedes. Most cherish fond childhood memories of getting up in the dark to watch an episode before heading off to school. In 1999, a competition was launched to identify the most popular ‘julkalender’ of all time. The winner was a spooky ghost story called ‘the mystery of Greveholm’. Closely behind were ‘Sune’s Christmas’, ‘The old woman who shrunk to the size of a teaspoon’ and ‘Magical times’. This year, the story is called ‘Hunt for the crystal of time’ and is starring a very popular, recently-deceased Swedish actor as the obligatory evil bad guy. In the series, he plans to stop time the day before Christmas Eve and the only people who can stop him are three children who have to journey to the center of the universe to do so. It’s all very exciting – what if they fail?! There will be no Christmas ever again! We’d all better hope they succeed! In just 5 days, we’ll find out!!!! ‘Julkalendern’ can be watched on SvtPlay you’d like to catch up! Did you know that Sweden has a very large number of choirs? Singing in a choir is in fact one of Swedish people’s favorite pursuits. That means that there are lots of choirs to meet various needs and interests: gospel choirs, political choirs, church choirs, integration choirs, indie choirs. So, it’s not surprising then that the first gay choir to be established in Europe came out in Stockholm. 35 years ago to be exact, just a short time before London’s Gay Men’s chorus was founded. As a conclusion of their 35 years’ celebrations, Stockholm’s Gay Choir is holding two Christmas concerts on Sunday 17th December at Playhouse Theater in Stockholm. Tickets can be bought via this link biljettkiosken.se/itschristmas or in the foyer an hour before the concert. Or find the choir on Facebook or their website. Buy a ticket, support a good cause and contribute to Sweden’s diversity. And get a bit of Christmas gaiety at the same time! See you there! And so it is Christmas. Like many places around the world, Sweden celebrates on Christmas Eve. Festivities throughout the day include eating the Christmas ham, receiving a visit from Santa, opening presents, drinking, playing board games and eating more. But the day usually kicks off with a steaming bowl of rice porridge. 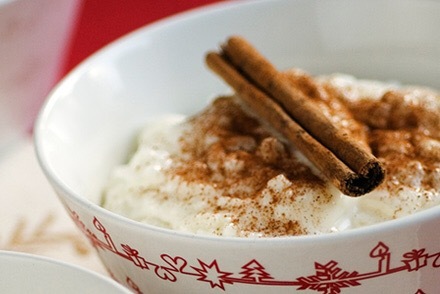 This delightful dish is made of rice, milk, sugar and cinnamon. Deep inside the porridge, there is often an almond. Presuming you don’t choke on it, if you find the almond it means you will be married during the following year. In the south of Sweden, and in Denmark, Norway and Iceland, the person finding the almond receives a gift. During the 1920’s it became trendy in Sweden to replace the almond with a ‘porridge doll’ made of porcelain and hide that in the porridge instead. Really superstitious people will even leave a bowl of porridge outside tonight to appease the house gnome who, according to legend, can make your cows dry up if he’s pissed off. But hopefully nobody should be pissed off on a day like today. And with family and friends gathered around a twinkling Christmas tree, a bowl of steaming hot rice porridge is a great way to kick off a lovely day.